Modern facade detail of the 1877 Pennsylvania Railroad station in Columbia located along North Front Street. Columbia Pennsylvania is a town steeped in transportation history, beginning with the area’s settlement led by English Quaker John Wright through the heyday of the Pennsylvania Railroad. Incorporated in 1814 and originally known as Wrights Ferry, settlers aspired to great accomplishments, renaming the town in honor of Christopher Columbus in an effort to entice Congress to select the town as the nation’s capitol. Despite a valuable endorsement by George Washington, Columbia fell just one congressional vote shy of this honorable distinction in 1790. Soon after, in 1812, Columbia lost another bid for distinction when Harrisburg was chosen as the capital of Pennsylvania due to its closer proximity to the Commonwealth's geographic center. By 1826 Columbia would be central to various modes of transportation including Wright’s Ferry, and a 5690’covered bridge that provided access to the west bank of the Susquehanna River in Wrightsville. More significant was the construction of a series of canals, establishing Columbia as the eastern terminus of the Main Line of Public Works Project. These canals eased travel to points west such as Pittsburgh, Lake Erie and West Virginia, and provided access to the Susquehanna & Tidewater Canal, opening the way east to Baltimore and other seaboard destinations. PRR in the vicinity of Front and Walnut Streets. Note the passenger station on the right. Date Unkown. Personal collection of Fred Abendschein. By the 1834 opening of the canal the town also became the western terminus of the Philadelphia and Columbia Railroad, which connected the namesake towns via Lancaster as the eastern extension of the trans-state Public Works. Though the P&C was far more effective than canal travel to the west, poor construction and inadequate equipment would hinder the railroad from operating efficiently. The 1846 charter granted to the Pennsylvania Railroad dealt a major blow to the Main Line of Public Works. By 1857 the growing private venture secured access to Columbia by purchasing the entirety of the system, including the P&C. Its rebuilding of the P&C and later use of canal alignments created a dedicated, all-rail route from Pittsburgh and points west to Philadelphia and New York City. The PRR would serve a major strategic asset to the North during the Civil War, and Columbia would also play a part during the Gettysburg campaign. As the war raged in Gettysburg, General Robert E. Lee planned to advance Confederate troops east via the Wrightsville – Columbia bridge to take Harrisburg, Lancaster and Philadelphia. The citizens of Columbia and the State militia burned the vital bridge preventing Lee’s troops from crossing into Lancaster County foiling their attacks. Shortly there after Northern troops would prevail and Columbia would settle into a time of industrial prosperity. 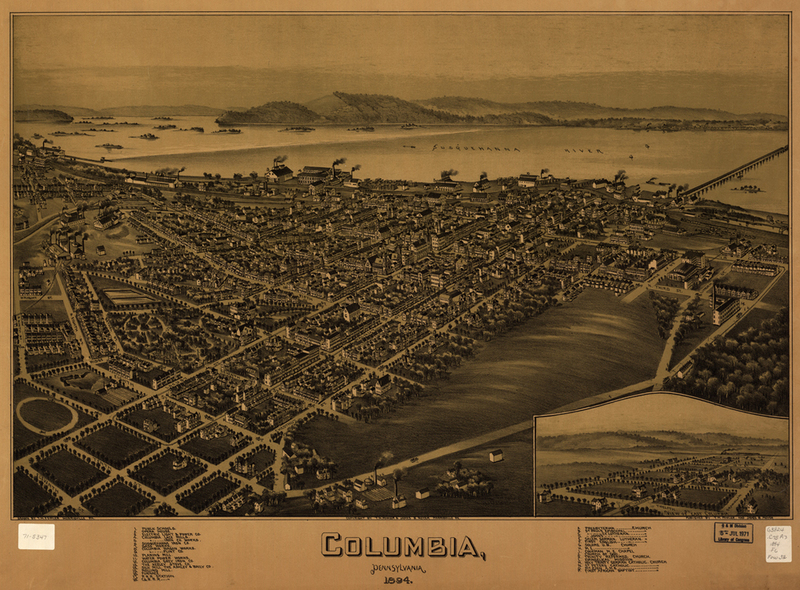 1894 map of Columbia at the peak of its industrial era by T. M. Fowler. Collection of Library of Congress Geography and Map Division. The bridge to Wrightsville was rebuilt yet again, and the Philadelphia and Reading Railroad would begin serving Columbia by way of the Reading and Columbia branch. With growing popularity the railroads would seal the fate of the remaining canals that survived hauling coal. 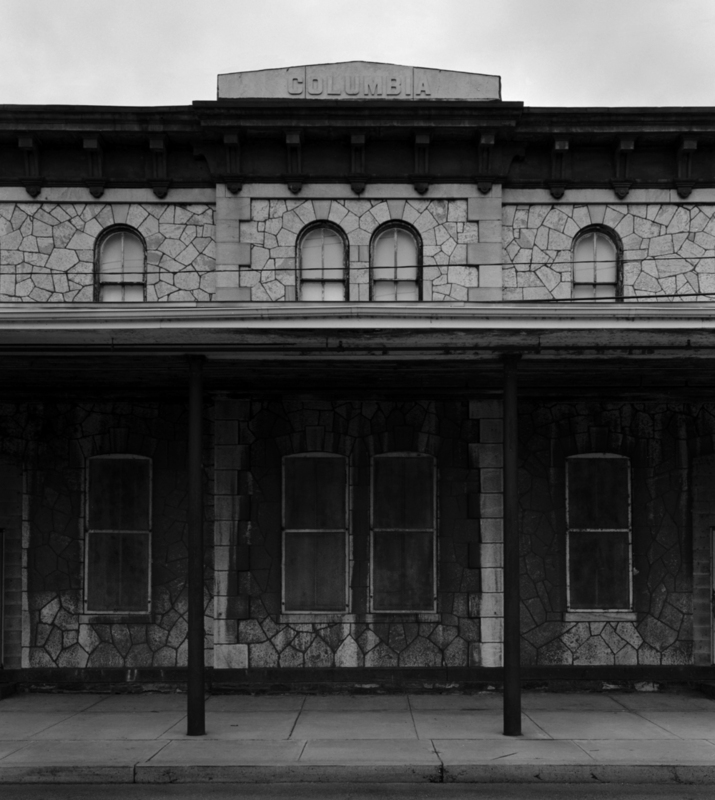 Columbia was at the heart of an area rich with iron deposits, now being transported by rail, fostering the rapid expansion of anthracite fired steel and iron forges throughout the Chiques, Conewago and Swatara valleys. Textile mills, lumber and the crossroads of passenger transportation also contributed to local economy. As a new century approached, Columbia had overcome early challenges and the ravages of war to reach its industrial peak, becoming a major railroad hub, host to extensive rail shops and yards, employing hundreds of local residents for both the PRR and Phildelphia and Reading railroads.